From the massive nationwide rally in support of immigrant rights in May 2006 to protests against the increasingly frequent immigration raids across the country, the public debate on immigration reform has largely centered on Mexican immigrants. Yet, in the United States, we rarely hear the Mexican perspective on the issue. In “portraits that defy American stereotypes of who is a Mexican immigrant” (Booklist), former Mexican foreign minister and eminent scholar Jorge G. Castañeda describes just who makes up the newest generation of immigrants from Mexico, why they have chosen to live in the United States, where they work, and what they ultimately hope to achieve. Drawing on his wide-ranging experience, Casteñeda examines the century-long historical background behind the labor exchange between Mexico and the United States, while offering an insider’s account of the official conversations and secret negotiations between the two countries in recent years. 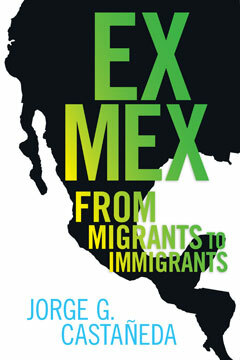 Both authoritative and timely, Ex Mex is essential reading for all who want to make sense of the complex issue of immigration.